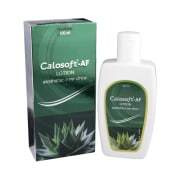 Calosoft AF Lotion is emollient is made from a mixture of Calamine, Aloe vera and liquid paraffin with water, to produce a thick moisturiser. It is a moisturizer that softens skin and protects skin. Calosoft AF Lotion is an Antiseptic and Antipruritic. Role of key ingredients: Calamine soothes and protects irritated skin. Aloe vera is very potent herb known for its skin soothing, anti inflammatory as well as antibacterial activity. It heals skin condition, moisturizes and improves the elasticity of the skin. Aloe Vera hydrates the dry skin area without leaving it oily or shiny. Light liquid paraffin is used as an emollient to prevent dryness of the skin. Useful in the treatment of: Itching and Pruritus Insect bites Skin allergy, Eczema and rashes Chicken pox sunburn Calosoft AF Lotion is used as a moisturizing agent for moisturising, soothing and protecting dry, damaged, inflamed or chapped skin. Directions for use: 1. Dab a little Calosoft AF Lotion onto the palm of your hand. 2. Apply on affected area, massaging in a slow, circular motion for maximum penetration. 3. It should be applied frequently to prevent the skin drying out. Dosage: As directed by the Dermatologist. Storage: Store In A Cool, Dry Place Away From Sunlight. Use under Medical supervision. A licensed pharmacy from your nearest location will deliver Calosoft-AF Lotion. Once the pharmacy accepts your order, the details of the pharmacy will be shared with you. Acceptance of your order is based on the validity of your prescription and the availability of this medicine.